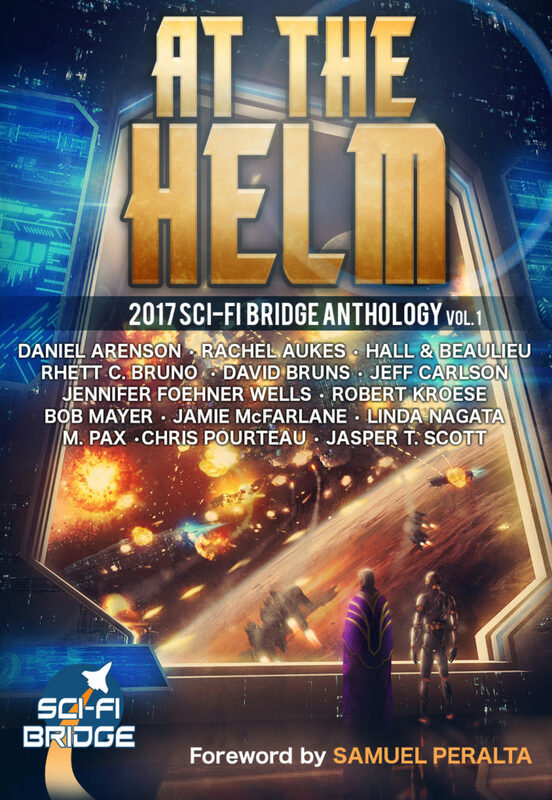 Sci-Fi Bridge is thrilled to present its first collection from bestselling authors and newly emerging writers. These stories span the near and far future. They transport you to worlds unknown. They examine today’s fears amid tomorrow’s technologies. From the far corners of the galaxy to the inner reaches of the human heart, the exciting stories in At the Helm will thrill, inspire, and make you wonder–do humans have what it takes to build a better future? Or are we doomed by our own failings? Want to know more about Sci-Fi Bridge? Visit www.scifibridge.com and subscribe to get exclusive access to Sci-Fi deals, new releases, giveaways and more! Available on Amazon for $0.99 here. “Pressure” by Jeff Carlson. First published in Strange Horizons. “This Long Vigil” by Rhett Bruno. First published in Perihelion Science Fiction Magazine. “Gao Yao Engine” by Rachel Aukes. “Brood Company” by Steve Beaulieu & Aaron Hall. “I, Caroline” by David Bruns. “Lara QR” by Bob Mayer. “Carindi” by Jennifer Foehner Wells. “Into the Dark” by Robert Kroese. “Pete, Popeye and Olive” by Jamie McFarlane. “Codename Delphi” by Linda Nagata. First appeared in Lightspeed Magazine. “Dark Space: A Chance Encounter” by Jasper T. Scott. 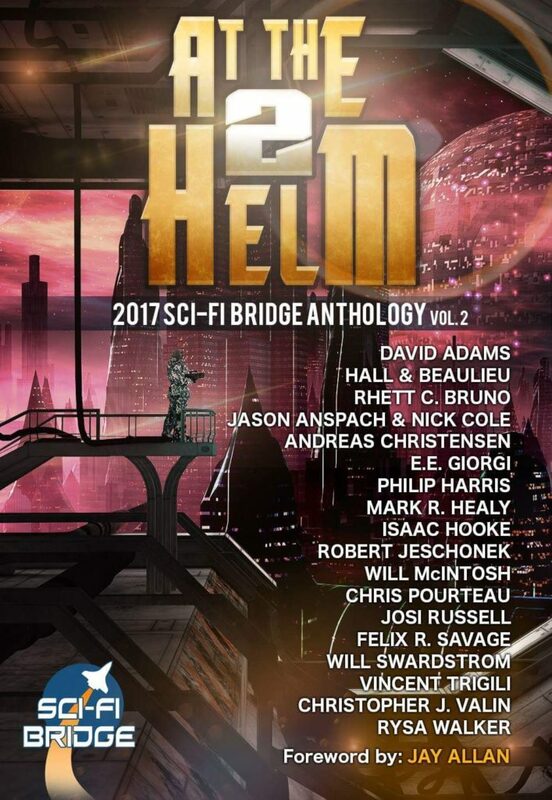 By popular demand, Sci-Fi Bridge presents its second collection from bestselling authors and newly emerging writers. In these pages, you’ll fall in love with new characters as varied as life itself. You’ll travel to and explore different, distant worlds. And you’ll get to know a treasure trove of talented authors. These stories span the length and breadth of time and space. They’ll take you to whole new worlds, created from the stardust of your own imagination. They’ll make you ask yourself: will we sacrifice our humanity as we embrace technology or will technology help ensure our future survival? From the far corners of the galaxy to the inner reaches of the human heart, the exciting stories in the At the Helm series will thrill, inspire, and make you wonder–can humans build a better future? Or do we merely carry forward the seeds of our own destruction as we colonize the stars? “Rubbish with Names” by Felix R. Savage. “Galaxy’s Edge” by Jason Anspach and Nick Cole. “A God Among Us” by Rhett C. Bruno. “Just An Old Fashioned Lust Story” by Christopher J. Valin. “The Quarium Wars” by E. E. Giorgi. “Death-Life on Kepler 452b” by Hall & Beaulieu. “The Tunnel” by Andreas Christensen. “The Null” by Vincent Trigili. “The Machine” by Mark R. Healy. “Bottled Lightning” by Philip Harris. “The Gambit” by Rysa Walker. “The Greatest Serial Killer in the Universe” by Robert Jeschonek. “Stasis Dream” by Josi Russell.